"Insolation" redirects here. It is not to be confused with Thermal insulation. The shield effect of Earth's atmosphere on solar irradiation. 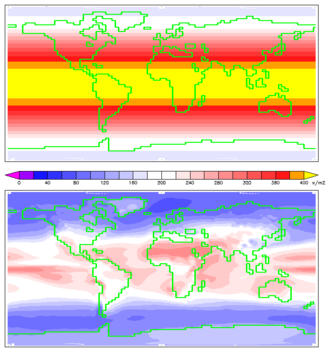 The top image is the annual mean solar irradiation (or insolation) at the top of Earth's atmosphere (TOA); the bottom image shows the annual insolation reaching the Earth's surface after passing through the atmosphere. Note that the two images use the same color scale. Sunlight carries radiant energy in the wavelengths of visible light. Radiant energy may be developed for solar power generation. Solar irradiance (SI) is the power per unit area (watts per square metre, W/m2), received from the Sun in the form of electromagnetic radiation as reported in the wavelength range of the measuring instrument. Solar irradiance is often integrated over a given time period in order to report the radiant energy emitted into the surrounding environment (joules pet square metre, J/m2), during that time period. This integrated solar irradiance is called solar irradiation, solar exposure, solar insolation, or insolation. Irradiance may be measured in space or at the Earth's surface after atmospheric absorption and scattering. Irradiance in space is a function of distance from the Sun, the solar cycle, and cross-cycle changes. Irradiance on the Earth's surface additionally depends on the tilt of the measuring surface, the height of the sun above the horizon, and atmospheric conditions. Solar irradiance affects plant metabolism and animal behavior. The study and measurement of solar irradiance have several important applications, including the prediction of energy generation from solar power plants, the heating and cooling loads of buildings, and in climate modeling and weather forecasting. There are several measured types of solar irradiance. Total Solar Irradiance (TSI) is a measure of the solar power over all wavelengths per unit area incident on the Earth's upper atmosphere. It is measured perpendicular to the incoming sunlight. The solar constant is a conventional measure of mean TSI at a distance of one astronomical unit (AU). Direct Normal Irradiance (DNI), or beam radiation, is measured at the surface of the Earth at a given location with a surface element perpendicular to the Sun. It excludes diffuse solar radiation (radiation that is scattered or reflected by atmospheric components). Direct irradiance is equal to the extraterrestrial irradiance above the atmosphere minus the atmospheric losses due to absorption and scattering. Losses depend on time of day (length of light's path through the atmosphere depending on the solar elevation angle), cloud cover, moisture content and other contents. The irradiance above the atmosphere also varies with time of year (because the distance to the sun varies), although this effect is generally less significant compared to the effect of losses on DNI. Diffuse Horizontal Irradiance (DHI), or Diffuse Sky Radiation is the radiation at the Earth's surface from light scattered by the atmosphere. It is measured on a horizontal surface with radiation coming from all points in the sky excluding circumsolar radiation (radiation coming from the sun disk). There would be almost no DHI in the absence of atmosphere. The SI unit of irradiance is watt per square metre (W/m2, which may also be written Wm-2). An alternative unit of measure is the Langley (1 thermochemical calorie per square centimeter or 41,840 J/m2) per unit time. 1 kW/m2 = (24 h/day)× (1 kW/m2) = (24 kWh/m2)/day = (365 day/year)×(24 kWh/m2)/day = (8760 kWh/m2)/year. 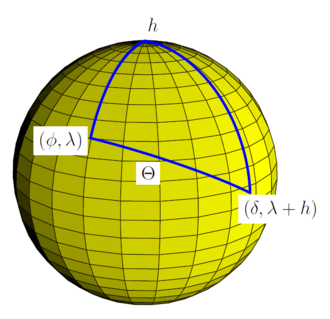 Spherical triangle for application of the spherical law of cosines for the calculation the solar zenith angle Θ for observer at latitude φ and longitude λ from knowledge of the hour angle h and solar declination δ. (δ is latitude of subsolar point, and h is relative longitude of subsolar point). The distribution of solar radiation at the top of the atmosphere is determined by Earth's sphericity and orbital parameters. This applies to any unidirectional beam incident to a rotating sphere. Insolation is essential for numerical weather prediction and understanding seasons and climate change. Application to ice ages is known as Milankovitch cycles. where β is an angle from the horizontal and γ is an azimuth angle. , the theoretical daily-average irradiation at the top of the atmosphere, where θ is the polar angle of the Earth's orbit, and θ = 0 at the vernal equinox, and θ = 90° at the summer solstice; φ is the latitude of the Earth. The calculation assumed conditions appropriate for 2000 A.D.: a solar constant of S0 = 1367 W m−2, obliquity of ε = 23.4398°, longitude of perihelion of ϖ = 282.895°, eccentricity e = 0.016704. Contour labels (green) are in units of W m−2. can be calculated for any latitude φ and θ. Because of the elliptical orbit, and as a consequence of Kepler's second law, θ does not progress uniformly with time. Nevertheless, θ = 0° is exactly the time of the vernal equinox, θ = 90° is exactly the time of the summer solstice, θ = 180° is exactly the time of the autumnal equinox and θ = 270° is exactly the time of the winter solstice. where n is a number of a day of the year. Total solar irradiance (TSI) changes slowly on decadal and longer timescales. The variation during solar cycle 21 was about 0.1% (peak-to-peak). In contrast to older reconstructions, most recent TSI reconstructions point to an increase of only about 0.05% to 0.1% between the Maunder Minimum and the present. Ultraviolet irradiance (EUV) varies by approximately 1.5 percent from solar maxima to minima, for 200 to 300 nm wavelengths. However, a proxy study estimated that UV has increased by 3.0% since the Maunder Minimum. 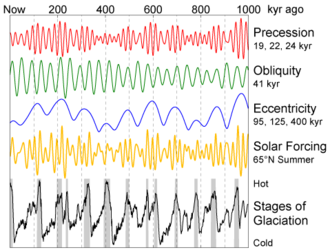 Variations in Earth's orbit, resulting changes in solar energy flux at high latitude, and the observed glacial cycles. , the precession index, whose variation dominates the variations in insolation at 65° N when eccentricity is large. For the next 100,000 years, with variations in eccentricity being relatively small, variations in obliquity dominate. The space-based TSI record comprises measurements from more than ten radiometers spanning three solar cycles. All modern TSI satellite instruments employ active cavity electrical substitution radiometry. This technique applies measured electrical heating to maintain an absorptive blackened cavity in thermal equilibrium while incident sunlight passes through a precision aperture of calibrated area. The aperture is modulated via a shutter. Accuracy uncertainties of <0.01% are required to detect long term solar irradiance variations, because expected changes are in the range 0.05 to 0.15 W/m2 per century. In orbit, radiometric calibrations drift for reasons including solar degradation of the cavity, electronic degradation of the heater, surface degradation of the precision aperture and varying surface emissions and temperatures that alter thermal backgrounds. These calibrations require compensation to preserve consistent measurements. For various reasons, the sources do not always agree. The Solar Radiation and Climate Experiment/Total Irradiance Measurement (SORCE/TIM) TSI values are lower than prior measurements by the Earth Radiometer Budget Experiment (ERBE) on the Earth Radiation Budget Satellite (ERBS), VIRGO on the Solar Heliospheric Observatory (SoHO) and the ACRIM instruments on the Solar Maximum Mission (SMM), Upper Atmosphere Research Satellite (UARS) and ACRIMSat. Pre-launch ground calibrations relied on component rather than system level measurements, since irradiance standards lacked absolute accuracies. Measurement stability involves exposing different radiometer cavities to different accumulations of solar radiation to quantify exposure-dependent degradation effects. These effects are then compensated for in final data. Observation overlaps permits corrections for both absolute offsets and validation of instrumental drifts. Uncertainties of individual observations exceed irradiance variability (∼0.1%). Thus, instrument stability and measurement continuity are relied upon to compute real variations. Long-term radiometer drifts can be mistaken for irradiance variations that can be misinterpreted as affecting climate. Examples include the issue of the irradiance increase between cycle minima in 1986 and 1996, evident only in the ACRIM composite (and not the model) and the low irradiance levels in the PMOD composite during the 2008 minimum. Despite the fact that ACRIM I, ACRIM II, ACRIM III, VIRGO and TIM all track degradation with redundant cavities, notable and unexplained differences remain in irradiance and the modeled influences of sunspots and faculae. Disagreement among overlapping observations indicates unresolved drifts that suggest the TSI record is not sufficiently stable to discern solar changes on decadal time scales. Only the ACRIM composite shows irradiance increasing by ∼1 W/m2 between 1986 and 1996; this change is also absent in the model. Recommendations to resolve the instrument discrepancies include validating optical measurement accuracy by comparing ground-based instruments to laboratory references, such as those at National Institute of Science and Technology (NIST); NIST validation of aperture area calibrations uses spares from each instrument; and applying diffraction corrections from the view-limiting aperture. For ACRIM, NIST determined that diffraction from the view-limiting aperture contributes a 0.13% signal not accounted for in the three ACRIM instruments. This correction lowers the reported ACRIM values, bringing ACRIM closer to TIM. In ACRIM and all other instruments but TIM, the aperture is deep inside the instrument, with a larger view-limiting aperture at the front. Depending on edge imperfections this can directly scatter light into the cavity. This design admits into the front part of the instrument two to three times the amount of light intended to be measured; if not completely absorbed or scattered, this additional light produces erroneously high signals. In contrast, TIM's design places the precision aperture at the front so that only desired light enters. Variations from other sources likely include an annual cycle that is nearly in phase with the Sun-Earth distance in ACRIM III data and 90-day spikes in the VIRGO data coincident with SoHO spacecraft maneuvers that were most apparent during the 2008 solar minimum. TIM's high absolute accuracy creates new opportunities for measuring climate variables. TSI Radiometer Facility (TRF) is a cryogenic radiometer that operates in a vacuum with controlled light sources. L-1 Standards and Technology (LASP) designed and built the system, completed in 2008. It was calibrated for optical power against the NIST Primary Optical Watt Radiometer, a cryogenic radiometer that maintains the NIST radiant power scale to an uncertainty of 0.02% (1σ). As of 2011 TRF was the only facility that approached the desired <0.01% uncertainty for pre-launch validation of solar radiometers measuring irradiance (rather than merely optical power) at solar power levels and under vacuum conditions. TRF encloses both the reference radiometer and the instrument under test in a common vacuum system that contains a stationary, spatially uniform illuminating beam. A precision aperture with area calibrated to 0.0031% (1σ) determines the beam's measured portion. 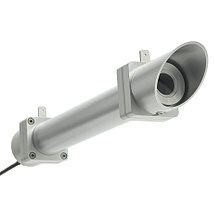 The test instrument's precision aperture is positioned in the same location, without optically altering the beam, for direct comparison to the reference. Variable beam power provides linearity diagnostics, and variable beam diameter diagnoses scattering from different instrument components. The Glory/TIM and PICARD/PREMOS flight instrument absolute scales are now traceable to the TRF in both optical power and irradiance. The resulting high accuracy reduces the consequences of any future gap in the solar irradiance record. The most probable value of TSI representative of solar minimum is 1360.9 ± 0.5 W/m2, lower than the earlier accepted value of 1365.4 ± 1.3 W/m2, established in the 1990s. The new value came from SORCE/TIM and radiometric laboratory tests. Scattered light is a primary cause of the higher irradiance values measured by earlier satellites in which the precision aperture is located behind a larger, view-limiting aperture. The TIM uses a view-limiting aperture that is smaller than precision aperture that precludes this spurious signal. The new estimate is from better measurement rather than a change in solar output. A regression model-based split of the relative proportion of sunspot and facular influences from SORCE/TIM data accounts for 92% of observed variance and tracks the observed trends to within TIM's stability band. This agreement provides further evidence that TSI variations are primarily due to solar surface magnetic activity. Instrument inaccuracies add a significant uncertainty in determining Earth's energy balance. The energy imbalance has been variously measured (during a deep solar minimum of 2005–2010) to be +0.58 ± 0.15 W/m²), +0.60 ± 0.17 W/m² and +0.85 W/m2. Estimates from space-based measurements range from +3 to 7 W/m2. SORCE/TIM's lower TSI value reduces this discrepancy by 1 W/m2. This difference between the new lower TIM value and earlier TSI measurements corresponds to a climate forcing of −0.8 W/m2, which is comparable to the energy imbalance. In 2014 a new ACRIM composite was developed using the updated ACRIM3 record. It added corrections for scattering and diffraction revealed during recent testing at TRF and two algorithm updates. The algorithm updates more accurately account for instrument thermal behavior and parsing of shutter cycle data. These corrected a component of the quasi-annual signal and increased the signal to noise ratio, respectively. The net effect of these corrections decreased the average ACRIM3 TSI value without affecting the trending in the ACRIM Composite TSI. Differences between ACRIM and PMOD TSI composites are evident, but the most significant is the solar minimum-to-minimum trends during solar cycles 21-23. ACRIM found an increase of +0.037%/decade from 1980 to 2000 and a decrease thereafter. PMOD instead presents a steady decrease since 1978. Significant differences can also be seen during the peak of solar cycles 21 and 22. These arise from the fact that ACRIM uses the original TSI results published by the satellite experiment teams while PMOD significantly modifies some results to conform them to specific TSI proxy models. The implications of increasing TSI during the global warming of the last two decades of the 20th century are that solar forcing may be a marginally larger factor in climate change than represented in the CMIP5 general circulation climate models. Average annual solar radiation arriving at the top of the Earth's atmosphere is roughly 1361 W/m2. The Sun's rays are attenuated as they pass through the atmosphere, leaving maximum normal surface irradiance at approximately 1000 W /m2 at sea level on a clear day. When 1361 W/m2 is arriving above the atmosphere (when the sun is at the zenith in a cloudless sky), direct sun is about 1050 W/m2, and global radiation on a horizontal surface at ground level is about 1120 W/m2. The latter figure includes radiation scattered or reemitted by atmosphere and surroundings. The actual figure varies with the Sun's angle and atmospheric circumstances. Ignoring clouds, the daily average insolation for the Earth is approximately 6 kWh/m2 = 21.6 MJ/m2. The output of, for example, a photovoltaic panel, partly depends on the angle of the sun relative to the panel. One Sun is a unit of power flux, not a standard value for actual insolation. Sometimes this unit is referred to as a Sol, not to be confused with a sol, meaning one solar day. Part of the radiation reaching an object is absorbed and the remainder reflected. Usually the absorbed radiation is converted to thermal energy, increasing the object's temperature. Manmade or natural systems, however, can convert part of the absorbed radiation into another form such as electricity or chemical bonds, as in the case of photovoltaic cells or plants. The proportion of reflected radiation is the object's reflectivity or albedo. 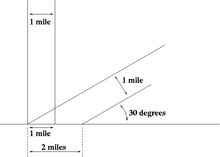 Projection effect: One sunbeam one mile wide shines on the ground at a 90° angle, and another at a 30° angle. The oblique sunbeam distributes its light energy over twice as much area. Insolation onto a surface is largest when the surface directly faces (is normal to) the sun. As the angle between the surface and the Sun moves from normal, the insolation is reduced in proportion to the angle's cosine; see effect of sun angle on climate. In the figure, the angle shown is between the ground and the sunbeam rather than between the vertical direction and the sunbeam; hence the sine rather than the cosine is appropriate. A sunbeam one mile (1.6 km) wide arrives from directly overhead, and another at a 30° angle to the horizontal. The sine of a 30° angle is 1/2, whereas the sine of a 90° angle is 1. Therefore, the angled sunbeam spreads the light over twice the area. Consequently, half as much light falls on each square mile. This 'projection effect' is the main reason why Earth's polar regions are much colder than equatorial regions. On an annual average the poles receive less insolation than does the equator, because the poles are always angled more away from the sun than the tropics, and moreover receive no insolation at all for the six months of their respective winters. At a lower angle the light must also travel through more atmosphere. This attenuates it (by absorption and scattering) further reducing insolation at the surface. 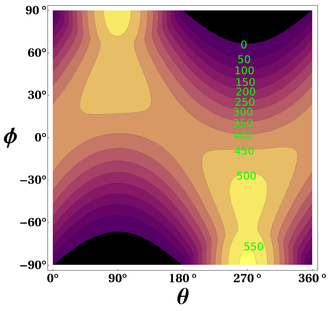 Attenuation is governed by the Beer-Lambert Law, namely that the transmittance or fraction of insolation reaching the surface decreases exponentially in the optical depth or absorbance (the two notions differing only by a constant factor of ln(10) = 2.303) of the path of insolation through the atmosphere. For any given short length of the path the optical depth is proportional to the quantity of absorbers and scatterers along that length, typically increasing with decreasing altitude. The optical depth of the whole path is then the integral (sum) of those optical depths along the path. When the density of absorbers is layered, that is, depends much more on vertical than horizontal position in the atmosphere, to a good approximation the optical depth is inversely proportional to the projection effect, that is, to the cosine of the zenith angle. Since transmittance decreases exponentially with increasing optical depth, as the sun approaches the horizon there comes a point when absorption dominates projection for the rest of the day. With a relatively high level of absorbers this can be a considerable portion of the late afternoon, and likewise of the early morning. Conversely in the (hypothetical) total absence of absorption the optical depth remains zero at all altitudes of the sun, that is, transmittance remains 1, and so only the projection effect applies. Assessment and mapping of solar potential at the global, regional and country levels has been the subject of significant academic and commercial interest. One of the earliest attempts to carry out comprehensive mapping of solar potential for individual countries was the Solar & Wind Resource Assessment (SWERA) project, funded by the United Nations Environment Program and carried out by the US National Renewable Energy Laboratory. Other examples include global mapping by the National Aeronautics and Space Administration and other similar institutes, many of which are available on the Global Atlas for Renewable Energy provided by the International Renewable Energy Agency. A number of commercial firms now exist to provide solar resource data to solar power developers, including 3E, Clean Power Research, Solargis, Vaisala (previously 3Tier), and Vortex, and these firms have often provided solar potential maps for free. In January 2017 the Global Solar Atlas was launched by the World Bank, using data provided by Solargis, to provide a single source for high quality solar data, maps, and GIS layers covering all countries. Solar irradiation figures are used to plan the deployment of solar power systems. In many countries the figures can be obtained from an insolation map or from insolation tables that reflect data over the prior 30–50 years. Different solar power technologies are able to use different component of the total irradiation. While solar photovoltaics panels are able to convert to electricity both direct irradiation and diffuse irradiation, concentrated solar power is only able to operate efficiently with direct irradiation, thus making these systems suitable only in locations with relatively low cloud cover. Because solar collectors panels are almost always mounted at an angle towards the sun, insolation must be adjusted to prevent estimates that are inaccurately low for winter and inaccurately high for summer. This also means that the amount of sun falling on a solar panel at high latitude is not as low compared to one at the equator as would appear from just considering insolation on a horizontal surface. Photovoltaic panels are rated under standard conditions to determine the Wp rating (watts peak), which can then be used with insolation to determine the expected output, adjusted by factors such as tilt, tracking and shading (which can be included to create the installed Wp rating). Insolation values range from 800 to 950 kWh/(kWp·y) in Norway to up to 2,900 kWh/(kWp·y) in Australia. In construction, insolation is an important consideration when designing a building for a particular site. The projection effect can be used to design buildings that are cool in summer and warm in winter, by providing vertical windows on the equator-facing side of the building (the south face in the northern hemisphere, or the north face in the southern hemisphere): this maximizes insolation in the winter months when the Sun is low in the sky and minimizes it in the summer when the Sun is high. (The Sun's north/south path through the sky spans 47 degrees through the year). In civil engineering and hydrology, numerical models of snowmelt runoff use observations of insolation. This permits estimation of the rate at which water is released from a melting snowpack. 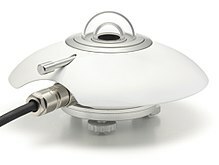 Field measurement is accomplished using a pyranometer. Irradiance plays a part in climate modeling and weather forecasting. A non-zero average global net radiation at the top of the atmosphere is indicative of Earth's thermal disequilibrium as imposed by climate forcing. The impact of the lower 2014 TSI value on climate models is unknown. A few tenths of a percent change in the absolute TSI level is typically considered to be of minimal consequence for climate simulations. The new measurements require climate model parameter adjustments. Experiments with GISS Model 3 investigated the sensitivity of model performance to the TSI absolute value during present and pre-industrial epochs, and describe, for example, how the irradiance reduction is partitioned between the atmosphere and surface and the effects on outgoing radiation. Assessing the impact of long-term irradiance changes on climate requires greater instrument stability combined with reliable global surface temperature observations to quantify climate response processes to radiative forcing on decadal time scales. The observed 0.1% irradiance increase imparts 0.22 W/m2 climate forcing, which suggests a transient climate response of 0.6 °C per W/m2. This response is larger by a factor of 2 or more than in the IPCC-assessed 2008 models, possibly appearing in the models' heat uptake by the ocean. Insolation is the primary variable affecting equilibrium temperature in spacecraft design and planetology. Solar activity and irradiance measurement is a concern for space travel. For example, the American space agency, NASA, launched its Solar Radiation and Climate Experiment (SORCE) satellite with Solar Irradiance Monitors. Wikimedia Commons has media related to Insolation. ^ a b Michael Boxwell, Solar Electricity Handbook: A Simple, Practical Guide to Solar Energy (2012), p. 41–42. ^ a b Stickler, Greg. "Educational Brief - Solar Radiation and the Earth System". National Aeronautics and Space Administration. Archived from the original on 25 April 2016. Retrieved 5 May 2016. ^ a b c "RReDC Glossary of Solar Radiation Resource Terms". rredc.nrel.gov. Retrieved 25 November 2017. ^ "What is the Difference between Horizontal and Tilted Global Solar Irradiance? - Kipp & Zonen". www.kippzonen.com. Retrieved 25 November 2017. ^ "RReDC Glossary of Solar Radiation Resource Terms". rredc.nrel.gov. Retrieved 25 November 2017. ^ "Part 3: Calculating Solar Angles - ITACA". www.itacanet.org. Retrieved 21 April 2018. ^ "Insolation in The Azimuth Project". www.azimuthproject.org. Retrieved 21 April 2018. ^ "Declination Angle - PVEducation". www.pveducation.org. Retrieved 21 April 2018. 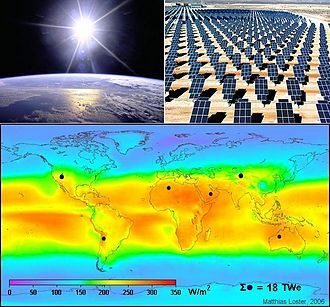 ^ "Part 2: Solar Energy Reaching The Earth's Surface - ITACA". www.itacanet.org. Retrieved 21 April 2018. ^ Wang, Y.-M.; Lean, J. L.; Sheeley, N. R. (2005). "Modeling the Sun's magnetic field and irradiance since 1713" (PDF). The Astrophysical Journal. 625 (1): 522–38. Bibcode:2005ApJ...625..522W. doi:10.1086/429689. Archived from the original (PDF) on December 2, 2012. ^ Krivova, N. A.; Balmaceda, L.; Solanki, S. K. (2007). "Reconstruction of solar total irradiance since 1700 from the surface magnetic flux". Astronomy and Astrophysics. 467 (1): 335–46. Bibcode:2007A&A...467..335K. doi:10.1051/0004-6361:20066725. ^ Steinhilber, F.; Beer, J.; Fröhlich, C. (2009). "Total solar irradiance during the Holocene". Geophys. Res. Lett. 36 (19): L19704. Bibcode:2009GeoRL..3619704S. doi:10.1029/2009GL040142. ^ Fligge, M.; Solanki, S. K. (2000). "The solar spectral irradiance since 1700". Geophysical Research Letters. 27 (14): 2157–2160. Bibcode:2000GeoRL..27.2157F. doi:10.1029/2000GL000067. ^ a b c d e f g h i j k l m n o p q Kopp, Greg; Lean, Judith L. (14 January 2011). "A new, lower value of total solar irradiance: Evidence and climate significance". Geophysical Research Letters. 38 (1): L01706. Bibcode:2011GeoRL..38.1706K. doi:10.1029/2010GL045777. ^ Stephens, Graeme L.; Li, Juilin; Wild, Martin; Clayson, Carol Anne; Loeb, Norman; Kato, Seiji; L'Ecuyer, Tristan; Jr, Paul W. Stackhouse; Lebsock, Matthew (2012-10-01). "An update on Earth's energy balance in light of the latest global observations". Nature Geoscience. 5 (10): 691–696. Bibcode:2012NatGe...5..691S. doi:10.1038/ngeo1580. ISSN 1752-0894. ^ a b Scafetta, Nicola; Willson, Richard C. (April 2014). "ACRIM total solar irradiance satellite composite validation versus TSI proxy models". Astrophysics and Space Science. 350 (2): 421–442. arXiv:1403.7194. Bibcode:2014Ap&SS.350..421S. doi:10.1007/s10509-013-1775-9. ISSN 0004-640X. ^ Coddington, O.; Lean, J. L.; Pilewskie, P.; Snow, M.; Lindholm, D. (22 August 2016). "A Solar Irradiance Climate Data Record". Bulletin of the American Meteorological Society. 97 (7): 1265–1282. Bibcode:2016BAMS...97.1265C. doi:10.1175/bams-d-14-00265.1. ^ "Introduction to Solar Radiation". Newport Corporation. Archived from the original on October 29, 2013. ^ Michael Allison & Robert Schmunk (5 August 2008). "Technical Notes on Mars Solar Time". NASA. Retrieved 16 January 2012. ^ "Solar and Wind Energy Resource Assessment (SWERA) | Open Energy Information". ^ "Determining your solar power requirements and planning the number of components". ^ "Optimum solar panel angle". macslab.com. Archived from the original on 2015-08-11. ^ "How Do Solar Panels Work?". glrea.org. Archived from the original on 15 October 2004. Retrieved 21 April 2018. ^ Nall, D. H. "Looking across the water: Climate-adaptive buildings in the United States & Europe" (PDF). The Construction Specifier. 57 (2004–11): 50–56. Archived from the original (PDF) on 2009-03-18. "The Sun and Climate". U.S. Geological Survey Fact Sheet 0095-00. Retrieved 2005-02-21.